Archie Dent knows about a secret society. A society that keeps the world safe from monsters that are unknown to most of the world. However, even though Archie knows about the secret society and the monsters, his parents are the ones who actually do anything to help save the world. But that all changes the day that his parents get brainwashed by the monsters that they are trying to protect the world from. And of course those small monsters that brainwashed everyone in the secret society are trying to wake one of the HUGE monsters that can really destroy the world. Now Archie (and some soon to be good friends and his robot babysitter) must figure out what to do to save the world. This is a fun science book that looks to be the beginning of a new series (hopefully). 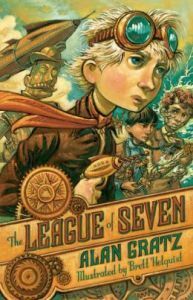 And kids who love crazy monsters, robots, flying ships, brains that walk around in jars, lasers, crazy-cool weapons, superpowers, secret societies, and whatnot will love this book. In fact, this is basically a whole bunch of fun bits that kids would love all thrown together into one book. There is lots of action and a quick pace. The only drawback is that for some kids there might be too many unusual things thrown at them all at once. But if they can navigate all the crazy descriptions of this new world then they will enjoy it. If you had a superpower, what power would you want? What weapon, robot, or other imagined nicknack from this book would you want to own? Why? Why didn’t Hachi tell Archie or Fergus about her past and all the people who she wanted to remember? If you could control electricity like Fergus, what would you do? What kind of program “cards” would you want Mr. Rivets to have if he was your wind-up robot? October 31, 2014 in book discussion questions, book review, elementary school, juvenile, middle school.